Service to Volkswagen owners is of top priority to the Volkswagen organization and has always included the continuing development and introduction of new and expanded services. This manual has been prepared with the Volkswagen owner in mind. The aim throughout has been simplicity, clarity and completeness, with practical explanations, step-by-step procedures and accurate specifications. Though the do-it-yourself Volkswagen owner will find this manual indispensable as a source of the same detailed maintenance and repair information available at an authorized Volkswagen dealer, the Volkswagen owner who has no intention of working on his or her car will find that reading and owning this manual will make it possible to discuss repairs more intelligently with a professional technician. Includes full manual transaxle rebuilding procedures, Digifant I and II fuel injection troubleshooting and repair (Digifant I On-Board Diagnosis), and Cabriolet power convertible top troubleshooting and repair. Includes special Fundamentals section. 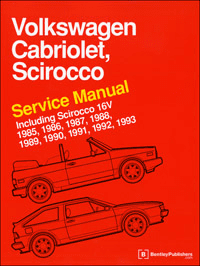 This Volkswagen Cabriolet and Scirocco service manual covers the model years 1985, 1986, 1987, 1988, 1989, 1990, 1991, 1992 and 1993, and includes Wolfsburg editions and Scirocco 16V. This manual was created specifically to cover Cabriolet and Scirocco models built for sale in the United States and Canada. Fundamental automotive concepts, with simple explanations of basic troubleshooting, effective workshop practices and tools. Complete tune-up specifications and adjustments, oxygen sensor and emission control testing, plus troubleshooting and repair of electronic ignition and knock control systems. Engine and cylinder head service, with the precise specifications and assembly details needed for complete engine reconditioning. Troubleshooting and repair of CIS and CIS-E fuel injection, plus the latest Digifant I and Digifant 11 engine management systems. Clutch and transmission troubleshooting, service and adjustments, and complete internal repair of the manual transmission and final drive. Suspension and steering inspection and repair, with strut replacement procedures and complete wheel alignment specifications. Disc brake and rear drum brake reconditioning. Body adjustments and repairs, including latches and locks, Scirocco sunroof, Cabriolet convertible top, and the optional power convertible top. Electrical troubleshooting, and complete wiring diagrams for all Cabriolet and Scirocco models. Plus the comprehensive Volkswagen factory tolerances, wear limits, adjustments and tightening torque specifications that you've come to expect from Bentley manuals.